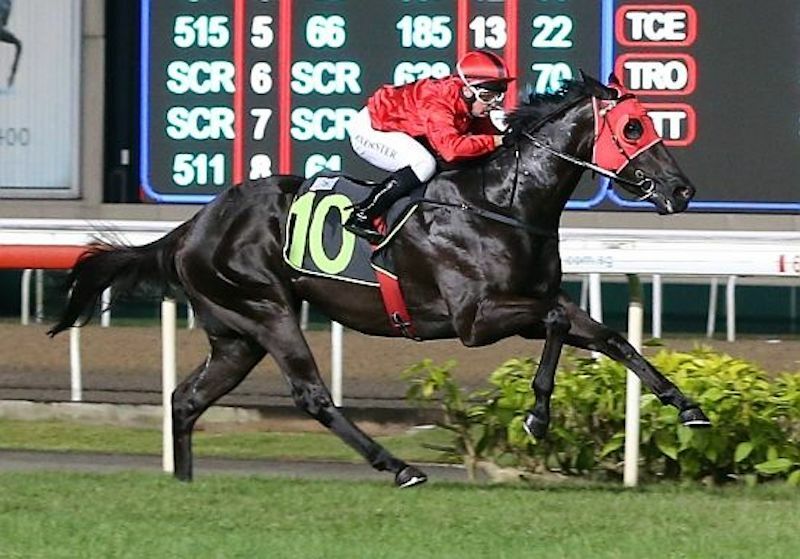 Singapore’s Victorian bred excitement machine Bold Thruster scored yet another resounding win over the weekend posting his third thrashing of the field in the same number of starts. The Patrick Payne bred, black three-year-old son of Blue Gum Farm’s Turffontein appears to be a star of the future providing multiple headlines for his sire. Blue Gum Farm’s Phillip Campbell has become even more impressed with the Singapore galloper at each of his start and is thoroughly enjoying watching him give his rivals a galloping lesson. “He certainly looks a little bit exciting, and he is a beautiful looking horse, being jet black and very strong,” Campbell said. While his trainer Shane Baertschiger has been cautious with the early career of his charger, the result over the weekend seemingly gave him no choice but to test Bold Thurster in black-type company. The Singapore Group 3 Garden City Trophy on October 21 has been pencilled in for Bold Thruster, but his long-term target is the Singapore Three-Year-Old Challenge (which incorporates three Group races from March to May). “Bold Thruster is not just another winner in Singapore, he is being talked up as a possible future star and the horse is building a picket fence which is fantastic,” Blue Gum’s Campbell said. Bred by Patrick Payne (who also trains Widgee Turf), Bold Thruster is from the winning Elusive City mare Aelia Capitolina. His second and third dams, Snaabelle and Inchedony, were both smart race mares winning to listed level. Bold Thruster was sold for $82,000 to Singapore interests through Leeanne Smith’s Bucklee Farm draft at the 2017 Inglis Premier Yearling Sale. Campbell said another Turffontein to look out for was the Gilgai Farm bred and Clinton McDonald trained 2YO colt Sir Menaduke who recently won a Caulfield jumpout. “He blitzed his rivals, and there are hopes that he will go to the Debutant Stakes on Caulfield Guineas Day and then to the Inglis race on Cox Plate day,” Campbell said.